You Eediot! (In a Ren, from Ren & Stimpy, voice). You just had to go running around in the middle of the night like a damned fool. Well, trail running is inherently dangerous. Things happen. But everything is ok. Yeah, I'm sure my ankle is fine. (Standing) I hope it's fine. (Walking) Dear Ultra Gods, please let it be fine. (Running) I'm just going to run for another half hour to make sure it's fine. I'd started running from my house at 11pm and did a few loops at Corbett's Glen. Then, tired of that trail and my inability to run faster than it took for spiders to reconstruct the cobwebs that I'd run through on the previous loops, I'd decided to run to Ellison. It seemed like a good idea at the time. 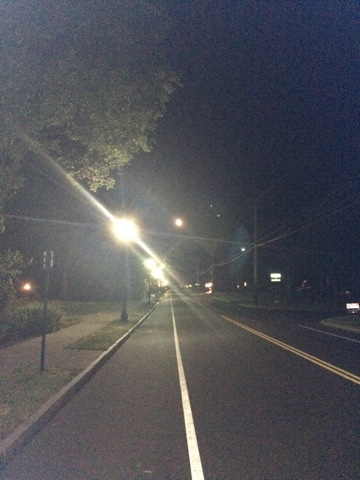 The moon was bright, the streets and trails were quiet and I felt great. Until I twisted my ankle on nothing and fell hard on both knees. But at least I didn't fall on any of the multitude of slugs that were also out and about on the trail. I walked back to the trailhead, then ran roads for half an hour, arriving home at 1am. I had intended on going to join the crew running the 0spf course at 7am, but when my throbbing ankle woke me up at 5:30am, I decided that would probably exceed my stupid ideas quota for the day. So I rested instead. Sunday morning I ran four miles on roads to test out my ankle. It hurt to the touch, but there was no pain when running or walking, so I decided to go to the Candlelight Preview Run at 8am. I walked the two 1-mile course options with the Valones, after which everyone present agreed that option two was the better course. The RD seemed to be leaning that way as well, so I then ran 7 loops of the second course. My ankle felt fine while running. And I think Saturday's fall/twist may have actually been an unwittingly fortuitous training move. Much of this course consists of fields around a horse farm and parts of it are like running on a Whack-A-Mole game board. If I spend 12 hours on this course on race day and don't twist an ankle or fall into a divot, it will be a miracle. I have no idea how I'm going to stay awake and keep moving for 12 hours, let alone refrain from falling into a hole. Let's hope July 23rd-24th is a night of miracles. Lyric of the moment: "When people run in circles it's a very, very mad world, mad world..." ~Gary Jules "Mad World"